I have seen It, I have traveled It, I have driven It, including that magnificent Amalfi coastal route, I have experienced a cutthroat Italian shave and now I have to share these travels as I simply cannot see so many inferiority complexes continue. However, I doubt if I can even slightly give justice to the experience, pleasure and sights I have seen on my three-week trip in this blogging attempt. 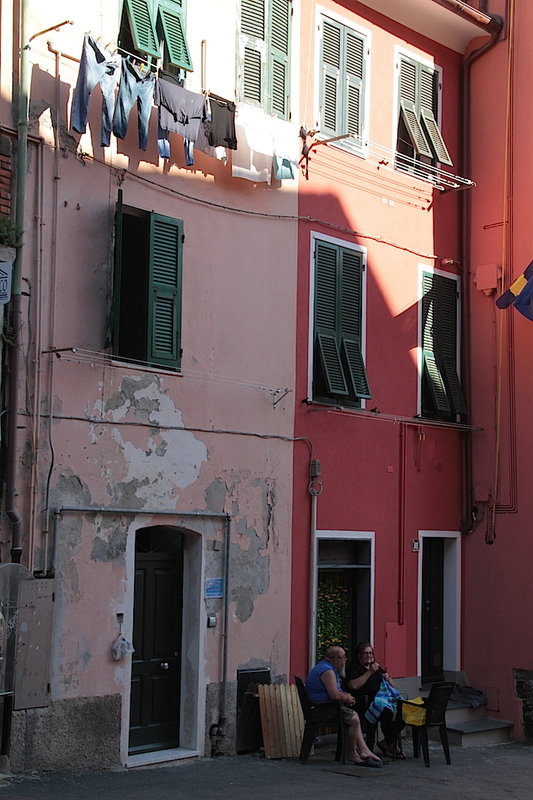 If, however, I can inspire just one to visit Italy because of this blog, I’ll be happy. 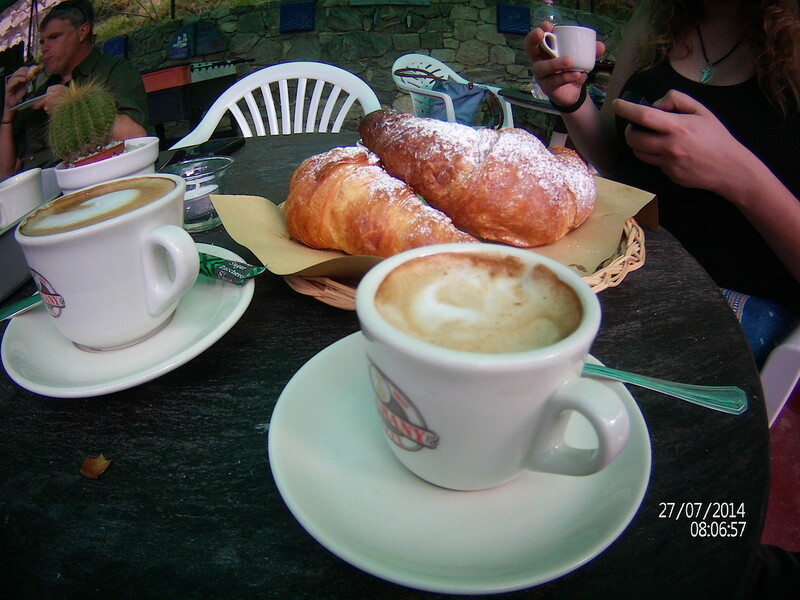 To add to an experience such as traveling Italy, its not a bad idea to take some of your best friends along. Sharing the beauty, the tastes, the wine, the music and friendship chatter with Andre en Rentia added that cherry on top satisfaction, which we had. It was good. The first delightful stretch of road I discovered was still in Austria where I traversed the Alps between Zell am Zee and Heiligenblut over the Großglockner Hochalpenstraße, all the way up to the Edelweißspitze. I seriously suffer from fear of hights and this road tested me to the extreme of my bravery as far as hights go. I will, however be tested further on this journey as far as narrow, winding roads and Italian bus, car and scooter drivers are concerned. I believe I am now an accomplished driver and may even appear as a guest ‘Stig’ on Top Gear. Jeremy must just first discover me! the Italian charm is mostly gone and replaced by a cheap plastic feel where shopkeepers are all but Italian and where the Gondola boats-men chat on cellphones and smoke rather than sing there once famous opera arias! Even those rows and rows of restaurant chairs on San Marco’s Square were pathetically empty, with some restaurants providing music to not a single customer at dinnertime. The once classy establishment had made way to a cheap ‘follow-the-flag-and-quickly-take-a-photo-from-a-distance’ type traveller who sees, but does not feel nor experience. Have the many years of exorbitant prices caught up with Venice, or is the Europe-wide influx of cheap labour and associated cheap stuff more to blame? It was a sad sad situation to observe. 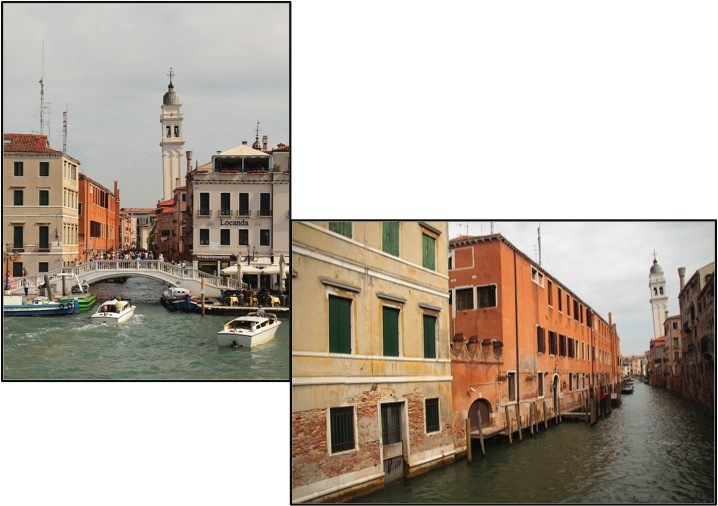 Very disgruntled by what we saw and experienced in Venice we were adamant to find some of the old charm for lunch and Cara took the lead out of the main streets. We were lucky. Seeing a little osteria (Da Mario at Fondamenta de la Malvasia Vecchia San Marco) tucked away in a quiet street we peaked through the door to see it filled with gondoliers. Surely, this is the local hangout and we must try it. It was the real deal, with cheap great food, beer and wine as well as an Italian ‘mamma’ running the tiny kitchen with all the charm, sweat and noise which one would want and expect as the scene from an Italian restaurant. Venice was not yet completely lost! 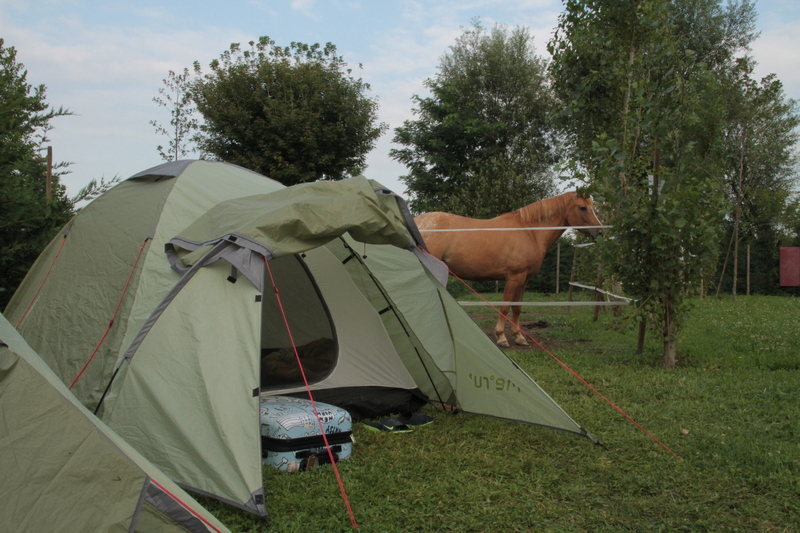 Despite the disappointment of Venice, our stay was a delight, even though we camped. I opted for the lessor advertised and harder to find Agricampeggio Mose on Punta Sabbioni. This camp is part of a working farm where they have a little stall selling the farm produce and which is run by (another) ‘Mama’, who even offer free transport to the ferry-bus and who runs the tiny café-bar, reception, shuttle service and no-English loud and fast Italian conversation with true Italian aplomb. Prepare for your survival by learning some life saving Italian phrases, such as ‘due espresso macchiato per favore’ and practice to say it in the required Italian rhythmic tone, with hands pointed backwards, all fingers clenched together and giving the beat of the request. Very important to then respond to Mama’s question, ‘latte caldo o freddo?’ with a confident ‘caldo’ (for hot milk) and not with a ‘huh!’ to prevent Mama whipping the floor with you! Even with the communication gap firmly in place, Mama’s sense of humor and joking with our ignorance regarding Italian ways and customs will make me recommend her camp-site with great pleasure. Just remember, Venice has plenty of water, take mosquito repellent. On the west coast in the famous Cinque Terre region is another magic, yet slightly menacing to reach campsite, Campeggio Il Nido, which has been owned and run by Roberto for the past 28 years. Reaching Campeggio Il Nido was, even including the drive across the Alps in Austria, my first real driving challenge, negating the winding and narrow roads with crazy death challenging Italian drivers, each in his own mind totally convinced that his Vespa, Fiat 500 or even Piaggio 3-wheel delivery van/scooter thingy was a full-blooded Ferrari! Il Nido is truly tucked away in the coastal bush, on the edge of the mountain and with the most amazing views of the Mediterranean imaginable. The campsite consist of a few terraces where mostly only two- or three-man tents will fit and since its not in town, its little restaurant is where the entire camp will gather in the evenings and leisurely sit, eat, chat or catch-up on their Facebook status! It was here where I noticed the small interesting little library, with a particularly interesting book, for this part of the world. 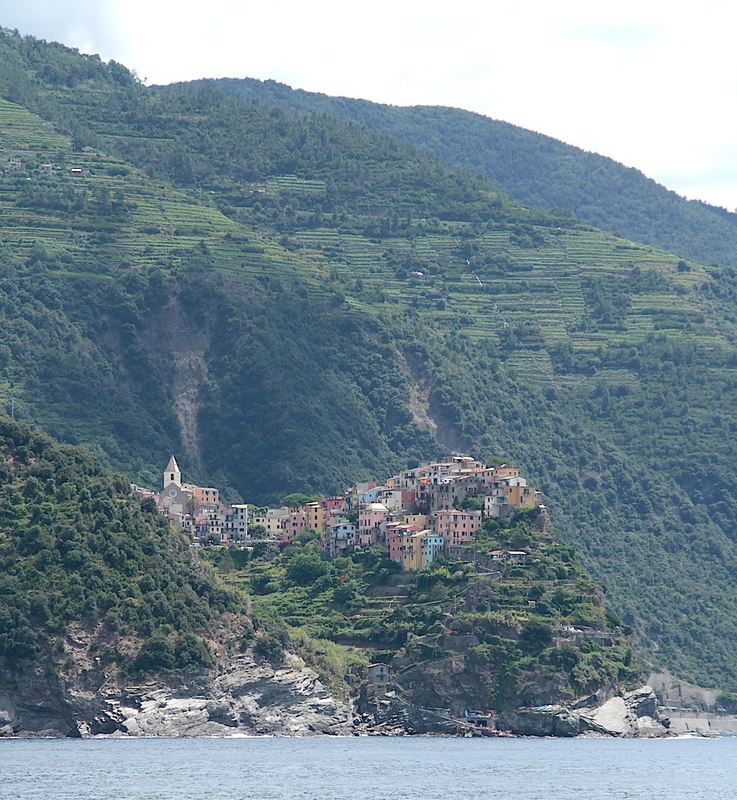 Although the five towns that make up the Cinque Terre (remember cinque means five) can be reached by train, taking the hop-on-hop-off boat proved to be a stunningly relaxing way to visit the towns, with the added advantage of providing those exquisite views from the sea on the towns. The five towns that make up this must-visit destination are Monterosso al Mare, Vernazza, Corniglia, Manarola and Riomaggiore. Five old world fishing villages consisting of one or two mentionable little streets lined by the most exquisite and quaint buildings proudly inviting the camera lens for more and more. 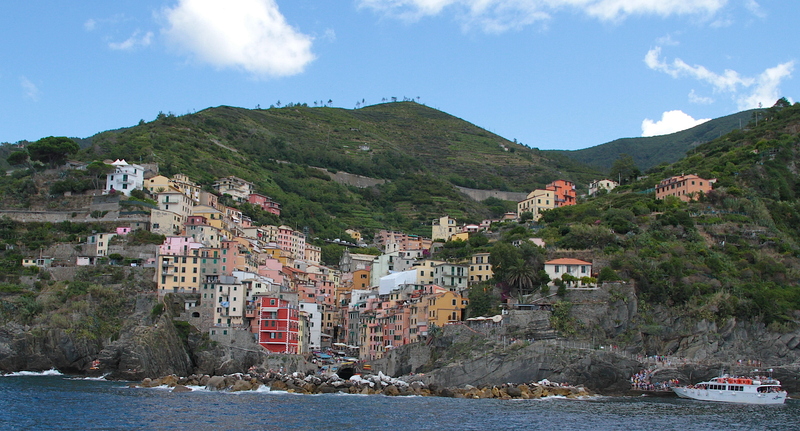 This coastline is rugged, with each town, except Corniglia, hugging a small bay/harbor where ‘the fish know all the fishermen and boats know each other’s name’, as Valiant Swart puts it so eloquently. 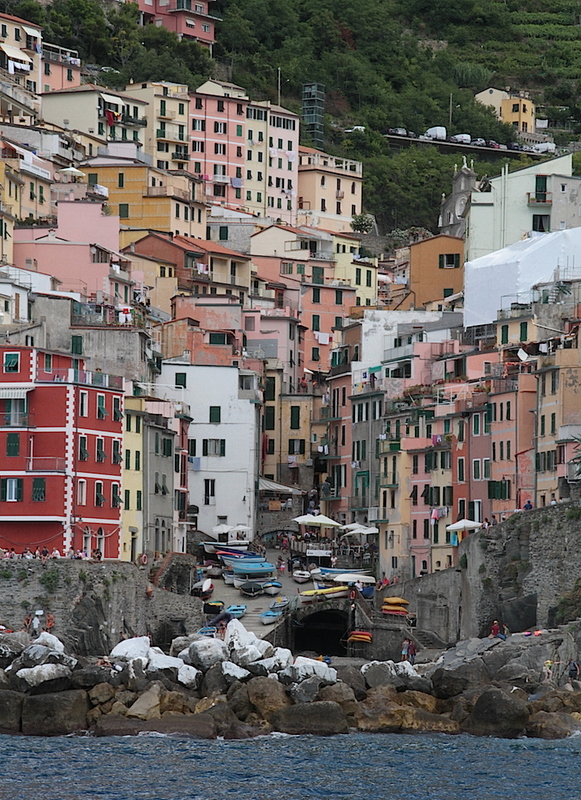 Cinque Terre should be very high on any prospective traveller’s bucket list. 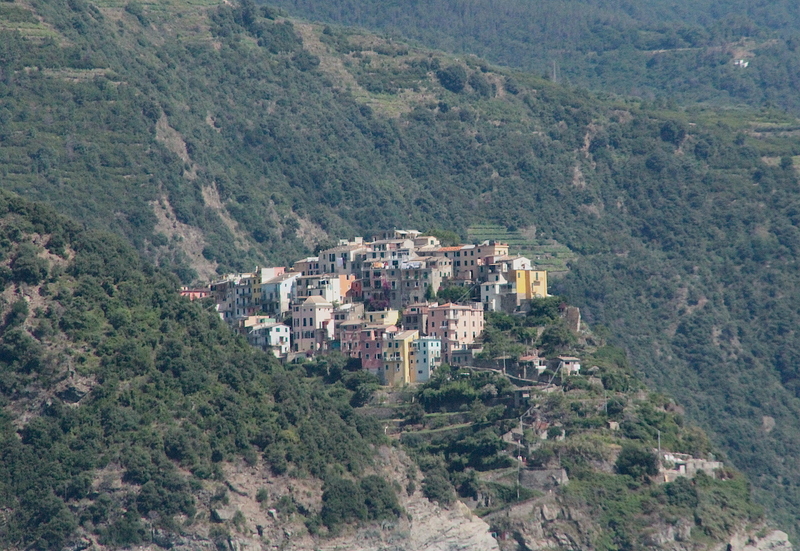 Whether you love simply wandering around, browsing the many little stores, dipping into the clear clear water of the Mediterranean, sitting and sipping something cold to wash away the salty anchovies or actively hiking, taking photos and ‘ticking off’ your bucket list items, you will be happy in Cinque Terre. And once we’ve accomplished that satisfactory happiness, slowly and hesitantly we turned our back on the beautiful five towns and the natural beauty linking them and headed for the famous leaning tower, the captivating Florence and the awe inspiring, history rich and fine cuisine of Tuscany and Amalfi. But that’s the next post. I love music. I listen to music and it makes me think. I hear the words, I link it to real life issues and happenings and I get inspiration, motivation or sometimes simply a smile. 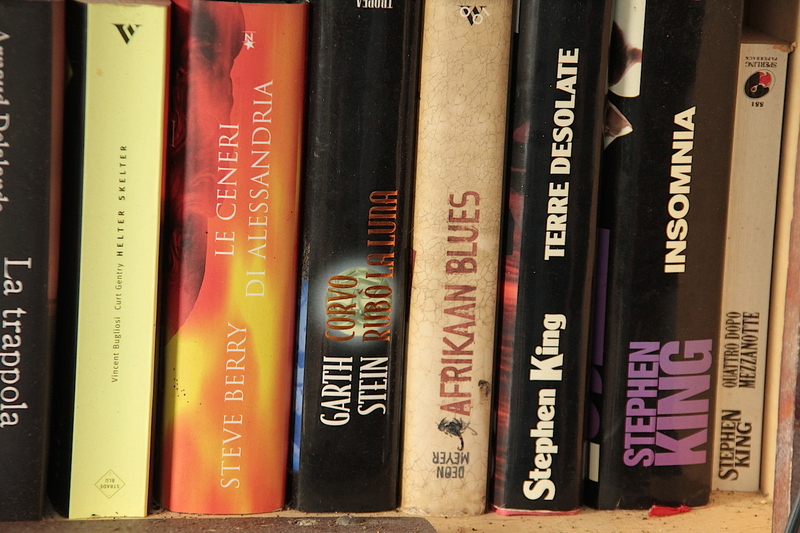 Most songs actually have a useable message in there somewhere; think of the profound life lessons in classics such as ‘Oops, I did it again’, ‘Papparazi’ or ‘Daar onder lê drie pikkewyne’ (Down there lies three penguins) and ‘Baby Tjoklits’. Me? I tend to prefer the real stuff. The Linkin Park, REM, Jan Blohm, Valiant Swart and of course Meatloaf type of stuff that is simply the inspiring uplifting songs with meaning, questions or philosophy entrenched in deep rhythm, rock, blues ……….. and ‘time’. I can’t stop wondering about some mystic ‘boer’, what I’ve done, in the end, a Van Goch touched canvass, those local odd-fellows behind the firehouse and how terrible it is to waste a kiss! And that is the one song that I often refer back to when I’m hesitant to jump on a new opportunity, ‘A kiss is a terrible thing to waste’, as performed by Meatloaf and written by Sir Andrew Lloyd Webber and Jim Steinman. This song is about letting the future in, and not allowing the things you leave behind to drag you back. However, last night on my way to my German lesson, as part of letting my future in, I was rudely taken back to the past and I realised again that we couldn’t ignore nor forget the past. We have to learn and improve from it. As I stepped off the bus at Sülzburger Gurtel a small little plaque in the pavement caught my eye. 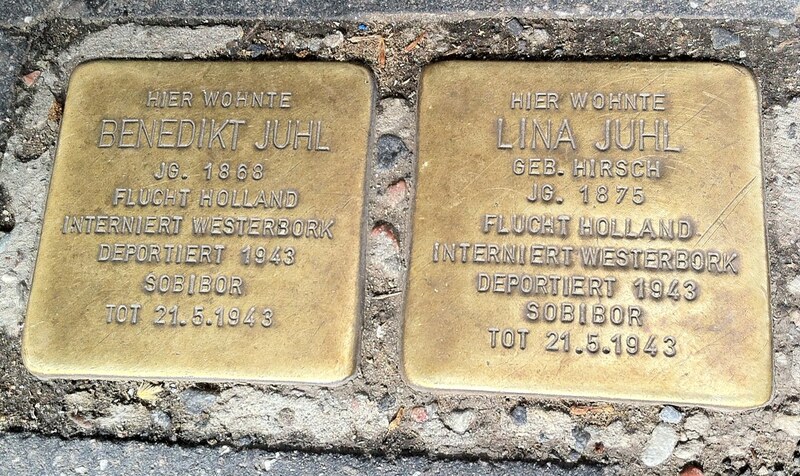 It was the commemorative plaque of Benedikt and Lina Juhl, plastered into the pavement tar and which simply stated that this is where the couple lived, before they fled to Holland, were imprisoned to Westerbork (see my blog posting Hup Hup Holland) and then deported to Sobibor, Poland in 1943. There they died on 21 May 1943, next week 70 years ago. The above paragraph-long sentence at least shows that my German lessons are working.